パペットホームズ、大河ドラマなどの好きなテレビ番組やラグビーについて書いています。アフィリエイトはやっていません。／Welcome to my blog. I write about some Japanese TV programmes including NHK puppetry and Taiga Drama, Sherlock Holmes and rugby. I don't do affiliate marketing. After swearing to serve Hideyoshi, Uesugi Kagekatsu leaves Nobushige and Kiri in Osaka. Nobushige becomes to serve Hideyoshi as umamawari-shu (a kind of the guards) to fill the vacancy of Tachibana Gonza who died suddenly. While accompanying Hideyoshi, he meets many people in Osaka Castle includes Chacha and sees the goods from abroad that are brought by Sen no Rikyu. He finds Kiri waits on Nei (Kita no Mandokoro). Meanwhile he is nearly threw into a well by Kato Kiyomasa who is said to have killed Gonza in a similar way though Kiyomasa is stopped by Toyotomi Hidenaga, brother of Hideyoshi. Hidenaga tells that the Toyotomis are from a farm family and it doesn't become to them to live in a castle. And in Ueda, Masayuki prepares for the battle with the Tokugawas but Uesugi Kagekatsu is told not to support the Sanadas in military matters. Nobushige tries to inform the change in the relationship between his family and the Uesugis but his letter is censored by Ishida Mitsunari. On the other hand, he is shown a letter of Tokugawa Ieyasu that asks to permit attacking the Sanadas. Hideyoshi asks him if it means that Ieyasu intends to obey him or not and Nobushige tells him it's a false. However, he allows Ieyasu to attack Ueda castle. Katagiri Katsumoto, vassal of Toyotomi Hideyoshi visits Hamamatsu to deliver Tokugawa Ieyasu a letter that allows him to attack the Sanadas. But it is prohibited on the following day for Hideyoshi just test the loyalty of Ieyasu to him. 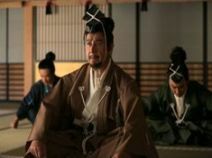 Masayuki sees the battle is false and takes a wait-and-see attitude if Hideyoshi's government lasts long or not and postpones paying a visit to him in Osaka. On the other hand, Nobushige notices a member in the dance company of Izumo no Okuni resembles his sister Matsu. While seeing their dance, he is asked to wait on Chacha whom he met and talked with in the absence of Hideyoshi. Meanwhile Hideyoshi makes his younger sister Asahi marry Ieyasu to urge him to visit Osaka. In addition, he sends his mother Naka as hostage and it makes Ieyasu decide to serve Hideyoshi. Ieyasu arrives Osaka and stays in the residence of Hidenaga. Then Hideyoshi and Nobushige come there and Hideyoshi asks him to play a trick in front of his vassals to give himself dignity. At first Ieyasu refuses but accepts it finally. Despite Ieyasu's vassalage to Hideyoshi, Masayuki still refuses paying visit to him. Then Uesugi Kagekatsu who has served him already sends his vassal Naoe Kanetsugu to persuade Masayuki. And Tori, mother of Masayuki tells her son to obey him superficially. Then he starts for Osaka with Nobuyuki and meets Nobushige in Osaka. But unlike many daimyos, the Sanadas are looked down on by Hideyoshi and his vassals. Besides Nobushige is sure that the dancer in Okuni's company is Matsu and takes her in his family. Matsu, who loses her memory gives a quizzical look to her father and brothers but Kiri's insignificant deed gets her memory back. Masayuki becomes a daimyo at last but yoriki to the Tokugawas. It means that he should support the Tokugawa's army whoｍ he has been opposed for many years. And Hideyoshi is please with becoming Dajo (Daijo) Daijin, one of the high ranked politician at that time. Masayuki (Masao Kusakari) meets Hideyoshi with his sons Nobuyuki (Yo Oizumi, right) and Nobushige (Masato Sakai). copyright © 2016 ベイカー寮221B／Baker House 221B all rights reserved.